Create with Gwen: Less Than a Month Left of Sale-a-Bration Freebies! 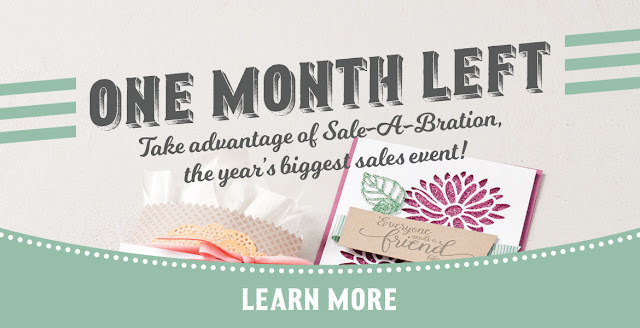 Less Than a Month Left of Sale-a-Bration Freebies! Yay! The weekend is here and I plan to be spending a lot of time in my studio, playing with more new SU products! Love it when an order is delivered just in time for the weekend. Today's post is a time sensitive reminder. Stampin' Up! Occasions Catalog runs until May 31, however the best promotion, Sale-a-Bration ends in less than a month! This party is over March 31! 1 Free Sale-a-Bration item for every $50 purchase! Click the pic and visit My Stampin' Up! business page to check out all the goodies! When it's over, it's over. 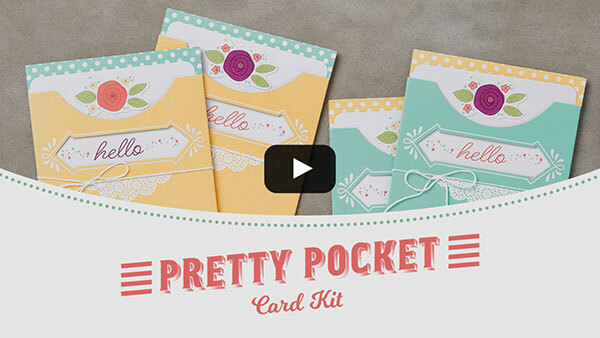 I have a few favs, one being the Pretty Pocket kit! Super cute, fun, easy to put together, and simply a creative way to send a message! I made some into gift cards/certificates, which make the perfect gift or reward for the crafty person who loves Stampin' Up! Set up in Microsoft Word and ran the inside card through the printer before putting the kit together. Get more bang for your buck! Host your own Stampin' Party with your friends for more Stampin' Rewards! Contact me to schedule your party! Wishing you a safe, happy, weekend with some time for stampin'. Place an online order in my store using the Code of the Month (on the right top of blog!) by the end of the month! Every order gets a "Thank You" card from me and One lucky stampin' friend will receive all the Stampin' Rewards accumulated! Please remember if your order is $150 don't use code, you will receive your own rewards! Want a hard copy of any current catalog in your hands? If you do not have a relationship with a demonstrator, contact me and I'll send you one! Join the Fun and Create some Happy!